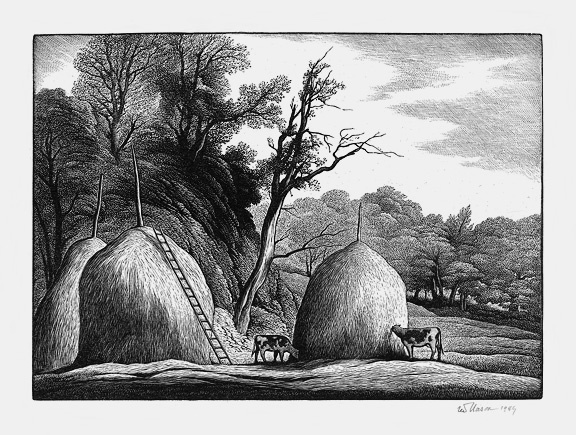 Haystacks- - 1949, Wood Engraving. CF 462. Edition 250. Signed and dated in pencil. Image size 6 3/8 x 8 7/8 inches (162 x 225 mm); sheet size 10 7/16 x 12 7/16 inches (262 x 316 mm). A fine, black impression, with full margins (1 11/16 to 2 1/4 inches) on cream wove paper. Soft creasing in the margins, not affecting the image; original paper tape hinge remains in the top left and right sheet corners; otherwise in excellent condition. 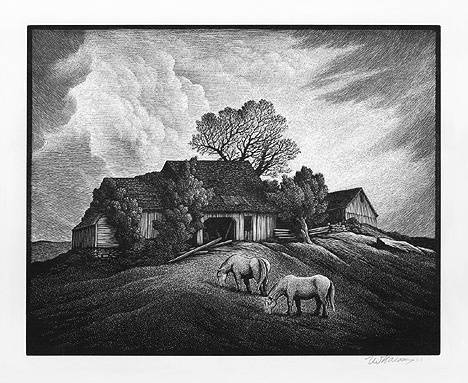 A Remote Farm- - 1959, Wood Engraving. CF 569. Edition 25. Signed and titled in pencil. Image size 7 15/16 x 10 inches (202 x 254 mm); sheet size 11 1/4 x 13 5/16 inches (286 x 338 mm). A fine, black impression, with full margins (1 7/16 to 1 7/8 inches) on cream wove paper, in excellent condition.